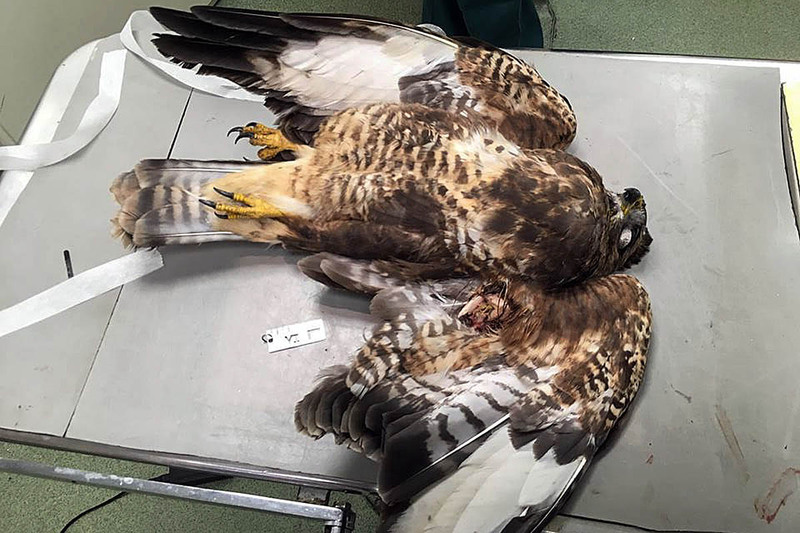 The carnage of birds of prey in England’s blackspot county continues, with North Yorkshire Police expressing frustration after the death of two more raptors. One red kite was found dead and a buzzard so seriously injured that it had to be put down. Both birds had been shot. North Yorkshire has the worst reputation for raptor persecution of any area in England. In the first incident, a large adult red kite was found dead by a member of the public on Thursday 25 October near Wath in Nidderdale. The bird was taken to a specialist vet to be x-rayed to determine the cause of its death. The x-ray uncovered two pieces of shot, which were lodged within the bird. On Thursday 8 November an adult buzzard was found by a member of the public, injured but still alive in Riccall near Selby. A police spokesperson said: “Despite efforts to save the bird, due to the extensive injuries that had been inflicted upon it, it had to be put to sleep. A spokesperson for the Nidderdale Moorland Group said: “We have been made aware of this incident and we are fully supporting the police investigation. Sergeant Kevin Kelly from North Yorkshire Police’s rural taskforce said “It’s with much frustration that I again make another witness appeal regarding two rare birds of prey, that we are privileged to have in our skies, being mindlessly and illegally shot. “If you have any information that will assist the investigation, please come forward and contact police via 101 and pass the information to the force control room. Please quote reference 12180210290 for the buzzard investigation and 12180199938 for the red kite investigation. “We have two extremely experienced wildlife crime officers leading these investigations and they will follow up on any tangible enquiries. What is the underlying reason for their unnecessary deaths? Hatred of birds / protecting estate incomes / moving target practice? If it is the usual claim that estates need to protect their incomes, what impact does a predator bird actually make? Their diet seems to be voles / moles / rabbits / carrion / even earthworms and yes, small birds. I visit North Yorkshire a lot for walking and holidays with family. Seeing birds of prey soaring is a fantastic sight. It introduces younger children to things they would not understand. Some areas of the UK have made great efforts to support their red kite populations, Dumfries and Galloway for example and their Red kite feeding stations, something my family love going to whenever we are in that area. 100+ red kites all feeding at the same time is awesome to watch. Yet North Yorkshire just want to kill them. Missing an opportunity to bring in a regular daily income, for when the shoot isn’t possible. Any land where raptor persecution has historically been an issue and where the evidence APPEARS to suggest the bird has been shot or poisoned will result in a 90 day suspension of all shooting activities. This then will include instances where a bird has vanished and their satellite tracker has gone dead. Time for the government to play hardball with these arrogant arseholes who think they are above the law. Who am I kidding though. Feeble polititians with pockets full of backhanders. This issue is never going away. Time for the government to play hardball with these arrogant a***holes who think they are above the law. The Nidderdale estates appear to have a real problem with this. Perhaps their CAP subsidies should be halted for a year or two to encourage them to get to grips with it.